New York City has always been shrouded in an aura of romance and mystery. And everywhere you look, from Times Square to Central Park, Manhattan best punctuates the point. So do the landmarks and cultural institutions that make up the Upper East Side. It was only a matter of time before an artist would stroll the streets and pick out architectural ornaments found on lesser-known buildings tucked just out of sight behind the better known chic boutique scene on Madison Avenue. That artist, a jewelry designer who graduated from the Cooper Union School of Art, is Rebecca Schiffman. If the name sounds familiar, you may have heard it before. She created a wildly inventive line of fashionable chain mail cuffs, bracelets, and dress grids a few years ago. That concept was clever enough, but it's her newest inspiration that is catching attention. All of her new work is inspired by the more timeless architecture that surrounds her. The Upper East Side Collection by Rebecca Schiffman. The Upper East Side (UES) Collection is a work of beauty, with each piece having a story. For example, the sterling silver geometric flower pendant isn't just imagined. 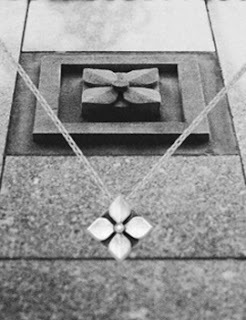 It comes with a story, inspired by the geometric flowers that adorn the building at 19 East 88th Street (William M. Dowling, 1936). The Art Deco design decorates the facade, lobby, and each individual apartment. The building wouldn't even exist, if not for the fearlessness of Nathaniel Wallenstein. He was one of the few people willing to build in the middle of the Great Depression. The other building is nearby, at 411 West End Avenue. Schiffman has two treatments for the pendant. The much more striking one is set with a 2mm diamond. She also uses the flower again as cufflinks, with solid curved bar pyramid backs. It's not improbable that a couple might consider a matching set. 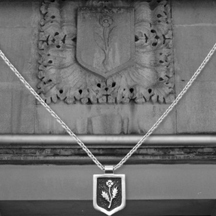 Another dazzling design, one of her earliest, is the sterling silver flower shield, crafted as a pendant or earrings. Like the geometric Art Deco flowers, the building at 1021 Park Avenue also has a story. It was designed by Rosario Candela, an Italian-American architect who defined the city's characteristic setbacks and signature penthouses. The building was one of his last to be completed during the boom. In addition to being an architect, Candela was also cryptologist. He even broke a historic military code that had long been considered unbreakable. Schiffman has plenty more designs, including a cuff bracelet inspired by a planter outside 11 East 88 Street, a racing hare that decorates the third floor of 1040 Park Avenue, and tulip earrings that borrow their inspiration from a fleur-de-lis facade at 5 East 92nd Street. The emerging collection's creativity carries old world architecture into the modern world. A Bit More About Jewelry Designer Rebecca Schiffman. The work she is putting into her new collection carries an authentic fascination with the Upper East Side. While some might rightly argue that the West Side has more architecture to tap, Schiffman is a lifelong resident of the area. After graduating from art school, she has gone on to study ancient jewelry techniques at Jewelry Arts Institute as well as casting and model making at Studio Jewelers, LTD. She currently studies under Feed de Vos in New York. His own studies are influenced by schools in Holland and Canada. Schiffman is working to launch her collection using Kickstarter. She has raised about half of her funding goal to date. There seems to be little doubt that she will meet her goal, but be aware that not all orders will be complete by December. The UES Collection By Rebecca Schiffman Sparks 7.2 On The Liquid Hip Richter Scale. While we usually avoid showcasing work that is still in development, Schiffman's work is stunning with its back story and simplicity. Somehow she has managed to capture the smallest details in the romance and mystery that surrounds the city. Most people walk by, day after day, and never even notice. Schiffman takes one small detail out of the ordinary and makes it extraordinary. While you won't find her newest collection at any boutique today, you can support the UES Collection on Kickstarter and become one of the first to own a piece, set, or larger part of the collection. In the interim, you can also visit her studio portfolio for updates. If you are looking for something sooner, such as December, you can always consider some of the vintage (unusually rare) or one-of-a-kind pieces at Charm & Chain. Some pieces are so unique (one of a kind), they are near impossible to review.